Can Reading Increase Your Lifespan? Home » General Health » Can Reading Increase Your Lifespan? I don’t mean to brag, but these letters I write you every day could really be helping you live longer. And I’m not just talking about the information I share about how to stay healthy; literally, the act of reading may be extending your life. Bookworms rejoice…people who read live longer! That’s according to a new study from Yale University’s School of Public Health. Based on its research, people who read more are less likely to die younger and can live up to two years longer than those who don’t read. Now, these e-mails might not be offering the absolute best benefit, as books were by far the best reading materials to extend life, followed by newspapers and magazines. I’m not sure how online reading impacted longevity, but I am sure it’s better than watching television. There have been other studies that indicate reading promotes longevity. Some have shown that reading fiction books promotes empathy while others have shown that reading fights cognitive aging by boosting connectivity among brain cells. However it does it, reading can be very important to longevity and mental health. The study looked at 3,635 participants who were a part of the Health and Retirement Study, a nationally representative sample of Americans 50 and over. Researchers reported reading tendencies at baselines and participants were followed for an average of 12 years. Those who read up to 3.5 hours per week were 17% less likely to die over the following 12 years than those who didn’t read; meanwhile, those reading 3.5 hours or more per week were 23% less likely to die than those who didn’t read. No matter how you look at it, those are some pretty staggering results. The authors of the study did note that of the people who read more, the majority tended to be women (who typically outlive men), college-educated, and in a higher income range. Therefore, it may be an overall lifestyle that attributes to the increase in longevity. Nevertheless, reading does stimulate the brain to protect it from aging, so let’s not overlook it as a component of a long life. All groups that read books—regardless of the factors mentioned above—experienced benefits for longevity. So, just like you want to take care of your physical health by eating right and exercising for 30 minutes per day, it might be worthwhile reading a book for the same amount of time per day. Instead of sitting down in front of the TV set or watching Netflix on your computer, pick up a good book and charge up your mind! Bavashi, A., “A chapter a day: association of book reading with longevity,” Social Science and Medicine, September 2016: 44-48; doi:10.1016/j.socscimed.2016.07.014. Berns, G., “Short- and long-term effects of a novel on connectivity in the brain,” Brain Connectivity, December 2013: 590-600; doi:10.1089/brain.2013.0166. Whiteman, H., “How fiction might improve empathy,” Medical News Today web site, July 20, 2016; http://www.medicalnewstoday.com/articles/311773.php. 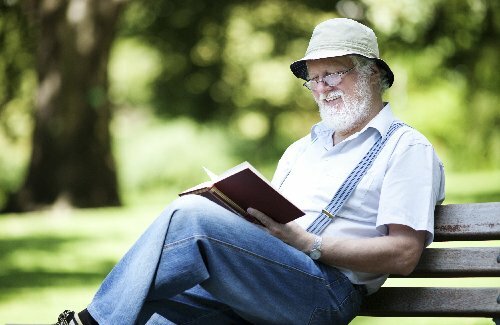 Whiteman, H., “Reading books could increase lifespan,” Medical News Today web site, August 8, 2016; http://www.medicalnewstoday.com/articles/312167.php.